Free International Travel Insurance You must pay an excess of A$200 for each claim other than the replacement of travel necessities. If you make more than one claim from a single event, the excess only applies once. Price Guarantee If you purchase personal goods in Australia and then find the same product advertised later at a cheaper price, you can claim back the difference if it is more than $75. Extended Warranty Warranty is extended for the same duration as the original warranty up to 1 year. $129 Annual Fee applies, this will be refunded for customers who spend $6,000 on eligible purchases with card within 12 months of account approval. Refunds will be posted automatically within 30 days of eligible spend criteria being met, if your account is current and in good state. Eligible purchases exclude interest free promotions, balance transfers, business expenses, cash advances, fees or charges, any disputed transactions, and any government fee or charge. 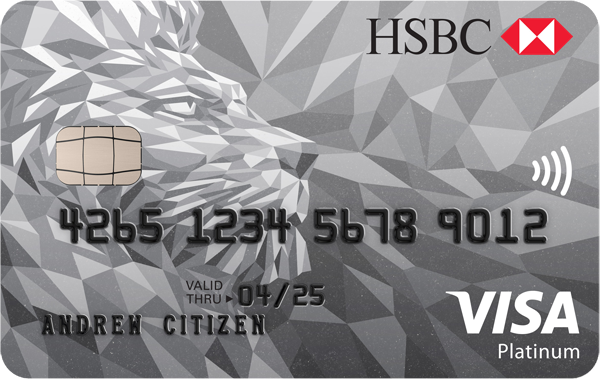 The HSBC Platinum Credit Card has a moderately high interest rate, a moderate interest-free period and a moderately high annual fee (refunded if yearly spending thresholds are met). It also comes with a moderate minimum credit limit and a high late payment fee. Cardholders can earn points for every dollar spent on eligible domestic and international purchases as part of the HSBC Rewards Plus program. Points can be redeemed for a range of gift card and merchandise rewards, or for Virgin Velocity frequent flyer points. Customers wishing to transfer and pay off existing debt can also take advantage of this card’s 0 per cent introductory balance transfer deal (a balance transfer fee applies). Complimentary insurance benefits include domestic and international travel insurances with rental car cover, transit accident insurance, extended warranty insurance, guaranteed pricing and purchase protection insurance. Five supplementary cardholders are also allowed at no additional cost. The HSBC Platinum Credit Card may be a good option for people who typically spend regularly on their credit card and pay off their balance every month. For these customers, this card offers solid rewards-earning potential and the ability to earn points quickly through multiple cardholders spending on the one account. While it might also be suitable for frequent travellers due to the complimentary travel insurance and frequent flyer program compatibility, this is not the best card to use due to high international transaction fees. This card might also suit people looking to switch lenders and pay off existing debt thanks to its introductory balance transfer offer. On the other hand, the HSBC Platinum Credit Card’s moderately high interest rate and fees mean it’s not especially suited to people on a tight budget or those who don’t always manage to clear their debt on a monthly basis. This card comes with plenty of advantages to suit a relatively wide customer base – the ability to earn rewards and frequent flyer points, a balance transfer deal, complimentary insurances and a variety of other perks. The allowance for five free additional cardholders is also a drawcard as it cuts down on costs and makes it possible to earn rewards points faster. While the card comes with a moderately high interest rate and annual fee, it’s hypothetically possible to avoid the annual fee by meeting the yearly spending requirements and avoid paying interest by clearing debt before interest accrues. However, as with most platinum cards, the potential for acquiring debt is increased – so it’s important to weigh up the advantages against the risks. If you’re not confident you can always pay your bill on time, you may want to look for a card that offers better value for money. To be eligible for the HSBC Platinum Credit Card, you must be at least 18 years of age, have a good credit rating and earn at least $40,000 a year. To apply, you will need to provide proof of ID, employment details and proof of reliable income such as bank statements or payslips. Applications can be completed in around 10 minutes online or by visiting an HSBC branch in person. You will usually receive a response within 60 seconds. HSBC Bank Australia, a subsidiary of HSBC Group, is one of the largest banking and financial services organisations in the world, and is based London. HSBC’s finance products include savings accounts, credit cards, home loans and personal loans, among other personal, business and corporate services. Banking services are available through the online banking portal, mobile banking app and in-branch. Customer support is available by phone, email, on Twitter or by visiting a branch.